Click anywhere on this image for further information. Definition: User Requirements Specification (URS). URS-level 1 = End user needs: URS-Level 2 = Executables + Training + Facility needs. URS-Level 3 = Software functionality in Level 1. Learn how to prepare a User Requirements Specification (URS) that will streamline your whole validation task. 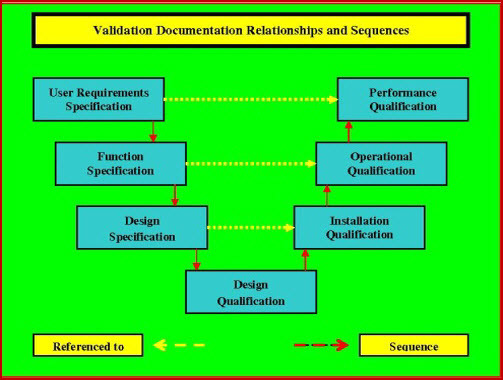 No matter whether the system is purely mechanical, or a mix of electro-mechanical, or solely a software program, the successful compilation and execution of the Installation Qualification (IQ) (for installation), Operational Qualification (OQ) (for functionality) and the Performance / Product Qualification (PQ) (for operability), is dependent on an URS containing clear, concise and testable requirements. 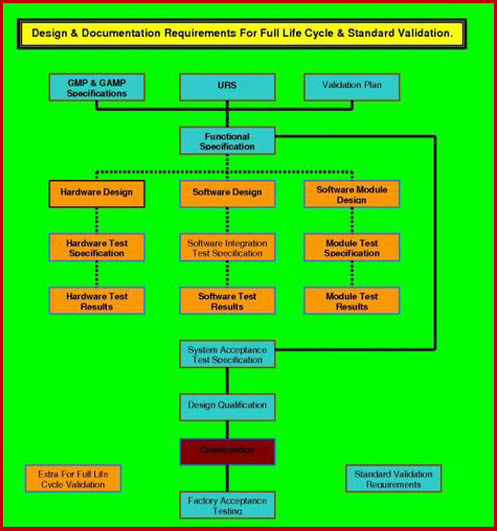 Once the end-user requirement specification or URS as it is commonly called; is documented, agreed and approved they form the basic URS Level-1 document. The engineers (or vendor) can then commence the preliminary design to establish exactly what functions are required for each of the items specified in the user requirements specification, the end user has listed. Once this functionality is documented and approved it forms the URS Level-2 document. This is the final level of the URS unless software is used. If software is to be used, the URS Level-2 document, is passed to the code writers. As the code is written, lines, or groups of lines, of code must be attributed to the individual functions that necessitate their presence. The completion of this task results in the completion of the document. Developing the URS to this level is unique in most industries, but is, standard practice in strictly regulated industries, as it is a major building block in the creation of quality software. The URS Level-3 document, contains all the traceability which is deemed mandatory for software assessed to be critical to product quality, in the pharmaceutical regulated industries. Full life cycle function testing. Bringing these needs and tasks together in a manner which will verify design fitness for purpose, has traditionally been a tedious and laborious labour. It involved trawling the VP and URS and cross- referencing to the Functional Specification and the Design Specification and the associated Test Specifications, sometimes, with only limited success. The design of our document is unique, it requires the URS to be an active document up to completion of the Design Qualification (DQ). The DQ will be executed against the three level URS, and verify that the code (if there is any) specified in URS Level-3, will deliver the functionality detailed in URS Level-2, which in turn will deliver the operability that the end user specified in URS Level-1. This document consists of a generic template which uses an attached SOP to allow you to quickly auto-populate the template. It then takes you page by page through the template allowing you to develop the template into your own bespoke company URS. Just ask about validation time that is saved using this simple and quick to produce a quality URS. User Requirements Specification (URS) Defined. The URS is originated by the end user extrapolating requirements directly from the production processes. These high end user requirements are then passed to engineering who are tasked with turning them into a complete procurement package. A package that will include all aspects of purchasing, installing and operating the specified system. Further to these direct requirements there are also a multitude of indirect requirements, such as; documentation, manpower, training and test equipment that must be fully researched, investigated and specified. The URS must be written in a format that allows each of these requirement to be verified as being “fully satisfied” or not. They must be comprehensive. Each and every requirement relating to product safety, identity, strength, purity, and quality must be identified. Hence, Quality Assurance (QA) must have a significant role in reviewing and approving the final list of requirements, and must be an approver of changes to any requirement that can affect the above product or process attributes (e.g., cGMP’s). Level-1, full details of end user operability. Level-2, full details of functionality. A full description of the required system performance. Performance criteria, critical parameters and operating range. All none industry standard testing that may be required. URS and the Software Life Cycle. URS in the Qualification Process.